Taking something that you think wouldn’t fit into the racing genre and making it work is not something uncommon in the video game world: Last month saw the launch of the 8th iteration of the Mario Kart franchise on the Wii U and has helped greatly in bolstering the sales of the struggling console; Diddy Kong Racing, a Mario Kart clone released back in the days of the Nintendo 64 also proved that you can infuse an adventure campaign into the genre, and who can forget Star Wars Episode 1: Racer, a game I received for my birthday back in 1999 that I put endless hours into and is arguably the best product that came from the existence of that film. The point I’m trying to make is that when I booted up a game that transplants the Batman universe into a combat racing game, I wasn’t immediately turned off, plus I mean you’ve got the Batmobile, which is easily one of the coolest vehicles in all of comic-dom. 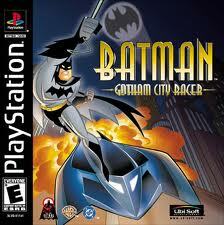 That optimism quickly changed in the first few missions of Sinister Games’ Batman: Gotham City Racer. GCR uses the word “Racer” in the title a tad loosely, as you’re not actually racing any opponents, just the clock, so a more accurate title may have been “Gotham City Driver.” It borrows a page from the above mentioned Diddy Kong Racing in that it does try to shoehorn in a 51 mission based adventure campaign. The “story” is that there’s been a mass breakout at Arkham Asylum, and it’s up to Batman to round-up all the escaped inmates…with driving? The story itself is as inane and lazy as its implementation in the game itself. Basically Sinister collected a series of cobbled together compressed video clips from “The New Batman Adventures” animated series and inserted them randomly to fit a given scenario to craft a story. 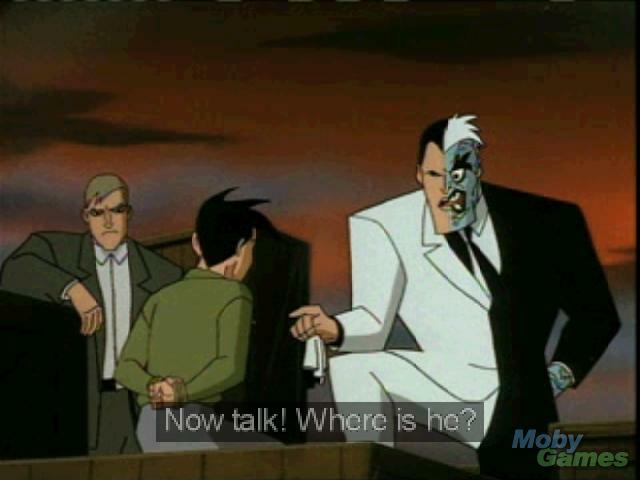 An example being one level where Batman has to get to the docks to stop Two-Face and upon completion a short clip from the origin of Tim Drake as Robin episode is played as a cut-scene. A more disrespectful example shows a clip of Scarecrow knocking Batgirl from the top of a building, the footage taken from an incredibly emotional and shocking episode where the character dies immediately from the fall, and you’re then tasked with rushing Batgirl to the Batcave for medical attention. Even the set up introduction video is the opening from the animated show, interjected with random blocks of texts and includes the “Q” for quality television symbol water mark. 51 missions in the story campaign does seem like quite a lot, but most missions can be completed in a manor of minutes and it only took me less than a day to easily complete all of them. The missions themselves also have little way in the variety and get old rather fast: You’ll either be tasked with driving from one place on the map to the other in a specified amount of time for a number of reasons but the end goal is always the same, tailing an enemy in the inconspicuous Batmobile where you’ll be fine as long as your mark stays in sight, or a “boss” battle scenario where the objective is to use your weapons to deplete your enemies life before the time limit expires. What’s worse than the tedious repetitive missions is actually controlling your vehicle. Steering feels stiff and less arcade-like then I would’ve preferred for a vehicle as fantastical as the Batmobile. Gathering speed is your greatest enemy as keeping your vehicle straight is hard enough, let alone when you have to make a turn as part of a chase. It also doesn’t help that gently touching anything, whether it’s a car, building or piece of scenery will spin you out of control and often require a restart mission from the pause menu. Your vehicle does have two options for both front and rear attacks, but you’ll never have to use the latter in the campaign as your only opposition will be in the front of your vehicle. Outside of the main game there’s a mode that lets you play as either a heroic character of a villain character in a vehicular form of cops and robbers. As the villains the goal is to capture as much loot, represented by “$” icons on the map, as possible, whereas the heroic characters are tasked with stopping them. This is the only mode where you’ll be able to play in anything other than the Batmobile or Batgirl’s Batcycle, and can also be played with a friend competitively as well. 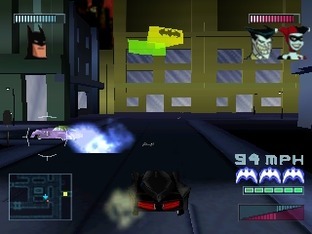 None of the vehicles really control any different from the Batmobile, though the other vehicles have a different themed weapon like Scarecrow’s gas or Mr. Freeze’s ice slick to make them more than a mere pallet swap. This mode does little to redeem the tedious story campaign despite the vehicle variety, and good luck finding a friend who’ll want to join in with you. The graphics try to capture the look of the show, and the overall map of Gotham City that you’ll drive across is pretty big, but the draw distance is quite poor to the point where everything is filling itself in as you’re driving. You’ll also be busy trying to follow the confusing mini-map to try and make it to your goal, as the Crazy Taxi-esque objective arrow the developer put in place helps little in getting you to your destination. A better may to design something like this would’ve been to quartine off sections of the city into race tracks to make navigation much more easier, but instead it’s a headache most of the time. GCR is a game geared toward a younger player with its simple vehicle based gameplay, but I wouldn’t even recommend this to that demographic due in a large part to the frustrating controls. The concept of a Batman themed racer or exclusive Batmobile game is something that could be really fun with the right idea or proper execution. Even the idea of something along the lines of a Mario Kart clone with a Batman skin would be pretty fun with the proper tone, but instead we’re left with a game that takes something as cool as driving the Batmobile and manages to make it a chore. GCR stands as another black eye in the Batman gaming legacy on the PSOne with the likes of Batman Beyond: Return of the Joker and Batman and Robin.